Right at the beginning of the month, Mr VE&T and I set off for a few days in Atlanta. We went for the wedding of Mr. VE&T's best friend from college - but we knew the groom-to-be would be busy with wedding prep... so we also had a lot of fun time to kick around and explore together. Even though it was super cold and rainy pretty much the whole entire time, we had a great visit. We went for some hikes when we were feeling hearty and resorted to walking around a few indoor malls when we felt wimpy but still wanted to go for a walk. Ha ha. We explored many different neighborhoods in Atlanta, visited a few major attractions (Martin Luther King Jr. Museum! ), and then just followed our nose and snooped around. It was great fun. As far as vegan travel in Atlanta... well, I'd say it's a mixed bag. If you're a vegan alone, or travelling with other vegans, I think it would be pretty easy to use Happy Cow or this excellent site to seek out vegan options. But, in my case, Mr. VE&T isn't vegan and I didn't feel like leading him on a 100% Happy Cow tour of Atlanta. Many places we came upon had exactly zero vegan options on the menu, a few had one option that was veganizable, and a few others actually had the word "vegan" to indicate vegan options. Ahhh. Always a welcome sight! We ate at Chipotle the first night we were there. We were hungry. It was good. One day we met up with a friend of mine who had just moved to Atlanta one week earlier (! ), and we wanted a place that would be yummy for all dietary preferences. We ended up at a sweet little spot called Jerusalem Bakery and Grill -- they had a totally excellent and huge vegetarian platter (along with a vast array of non-vegan options). They had all sorts of non-vegan baked goods, but I wasn't sad, because they also had super-fresh flatbreads covered in za'atar... which is pretty much my idea of heaven. Between my flatbread, my enormous veggie platter, and the fresh pitas that came with it... I was a happy camper. They also had a little Middle Eastern market inside, with many tempting items. I got myself a few packages of Turkish Delight, because I love that stuff. I would definitely go back to this place. Also, the vibe in there was so sweet. It seemed like a family place with super friendly staff, and it was full of such a diverse and friendly clientele. In fact, the servings were so generous that I had quite a bit leftover. No worries -- that was the night of the wedding and I was guessing that there might not be much for me to eat at the wedding. That night I got myself all dressed up, nice clothes, necklace, etc etc. But instead of a classy little clutch bag like all the other ladies, I brought along a purse full of food! ha ha. I had a Vega all-in-one Chocolate Cherry bar (new favorite flavor, for sure!) and my leftover falafel/hummus/za'atar/pita stuff. Mmm. Lo and behold, there was approximately nothing for me to eat at the wedding, so I discretely busted out my leftovers and was happy as a clam! Yay! Quite a while ago, the folks from Smoothie King offered to send me a gift card to try out a sample of their new vegan smoothies. I hadn't heard of Smoothie King, because there isn't one near my house, so I told them I couldn't make use of the gift card. They offered to send me one anyway, on the off chance that I might have an opportunity to try one sometime. Well! Guess what? 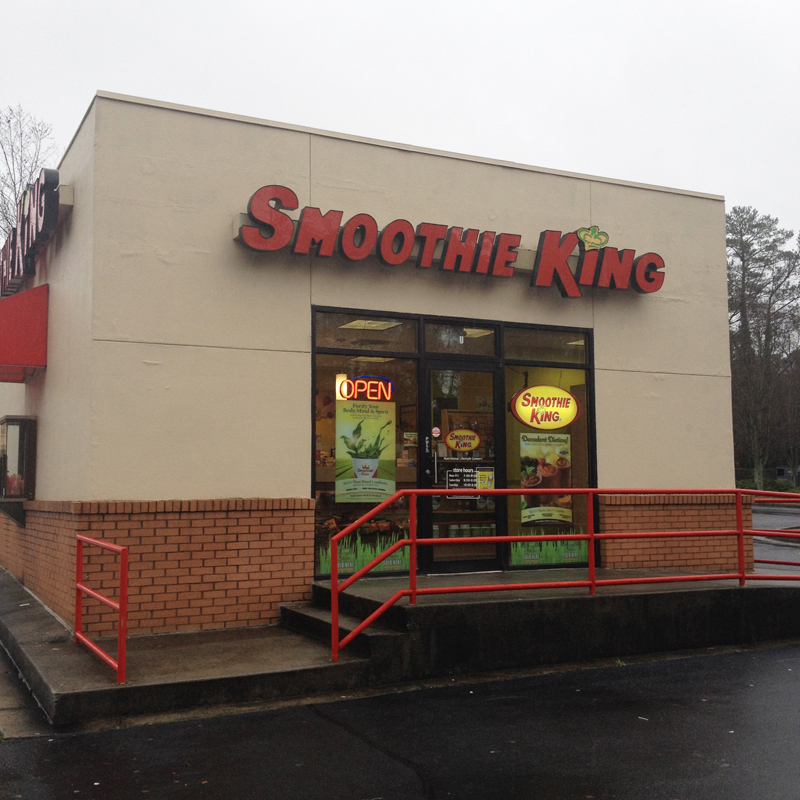 There are Smoothie King locations located approximately every 10 feet in Atlanta! So convenient! Having rejected the unappealing buffet breakfast in our hotel lobby, we set out for a day of fun with empty tummies. 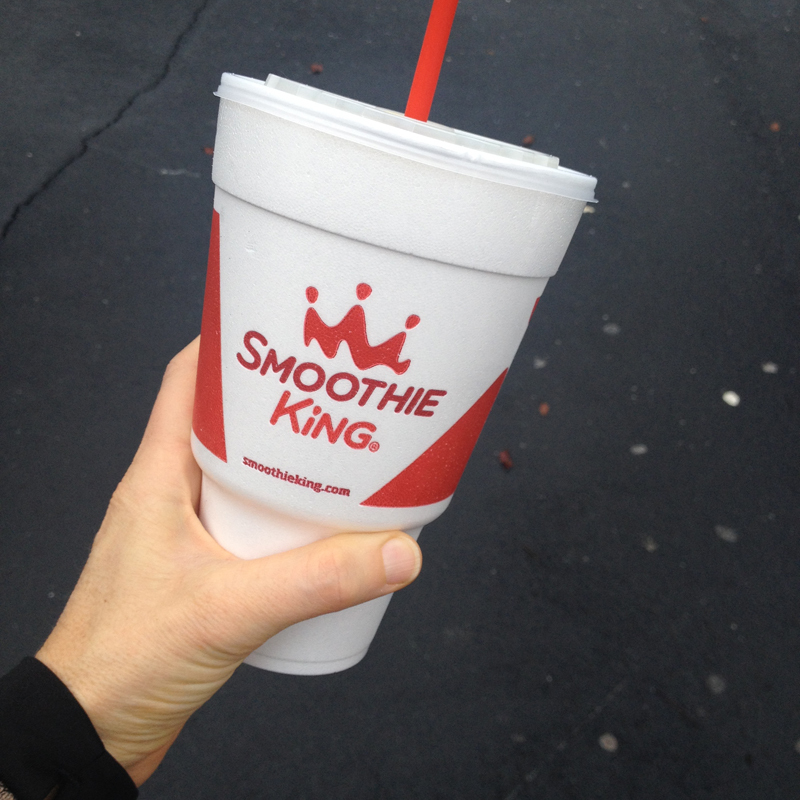 When we passed our first Smoothie King of the day, we decided to do the deed! 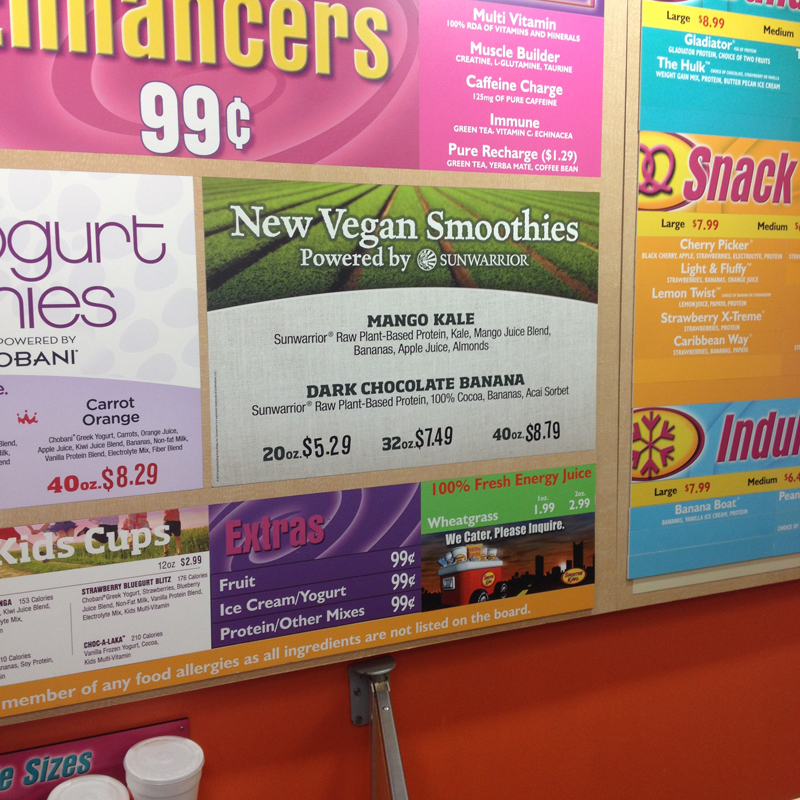 Smoothie King had two vegan options: Mango Kale and Dark Chocolate Banana. The man behind the counter suggested Mango Kale, so we maxed out our gift card and got a medium sized smoothie. Inside the shop they also sold many vegan snacks, vegan cookies, PB2, and a lot of other vegan friendly nibbles. Good to know! 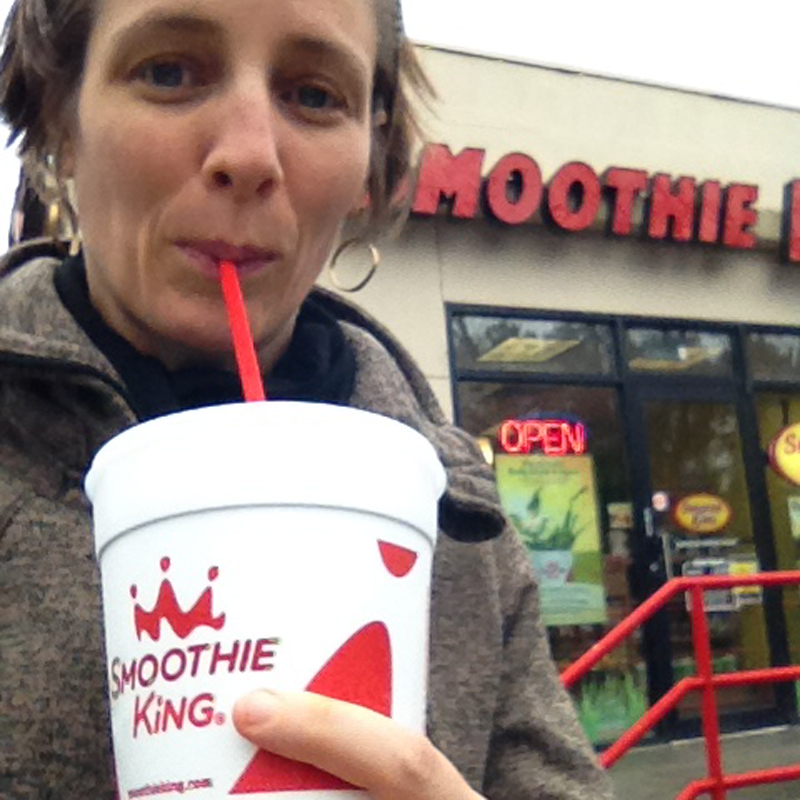 As you can see from the photos, the smoothie was huge! It was sweeter than my usual homemade smoothies, but that's no surprise since I never add sugar to my smoothies. I'm not sure how much kale was actually in there, because the smoothie was a very pale green color - and we all know that even a little bit of kale packs a lot of green power. Still, the smoothie was quite tasty and loaded with Sun Warrior vegan protein powder, which was really great. In a funny way, this gift card served me better far from home than it would have here at home! That very same day, we ended up stumbling upon the Atlanta Belt Line park, which is a long park full of people and dogs and kids. It was great fun and not even raining! We found a neat looking gentrified area full of artisinal small food businesses, but there was absolutely nothing vegan to be found. Further afield, my tummy rumbling with vegan desperation, I spotted a place called "Kale Me Crazy." Very promising indeed. 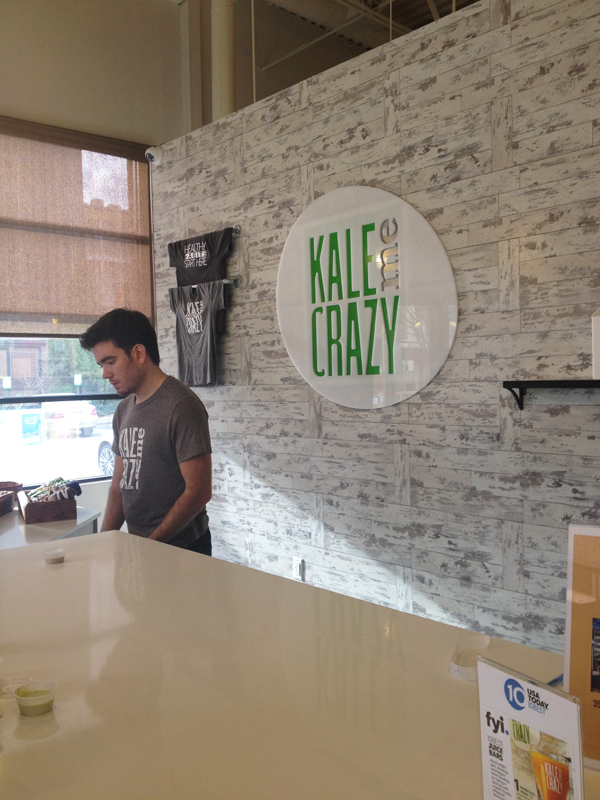 Kale Me Crazy is a juice bar that also offers salads and wraps. I ordered a Hummus Kale Wrap, but then Mr VE&T ate half of it, so we ordered another one. Ha ha! It was super healthy tasting, not super filling - but quite yummy and I was content. We also struck up a conversation with a lovely gal sitting next to us who was a bodybuilder, dating a vegan, and reluctantly adding meat back into her diet to bulk up for competition. Girl! I told her all about Definition for Ladies Magazine, gave her my blog url, gave her some vegan weightlifting sites, and told her to email me if she had any questions! sub-standard iphone pic of delicious food. Later that night, after a long day of scooting around the city, we ended up stumbling upon a gem of a spot - True Food. 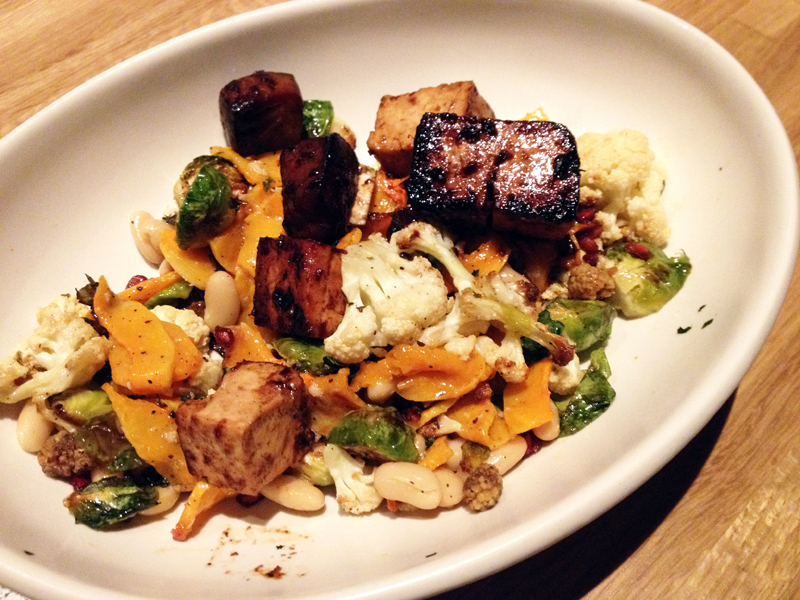 The menu isn't all vegan, but they have many vegan (and gluten-free) options. 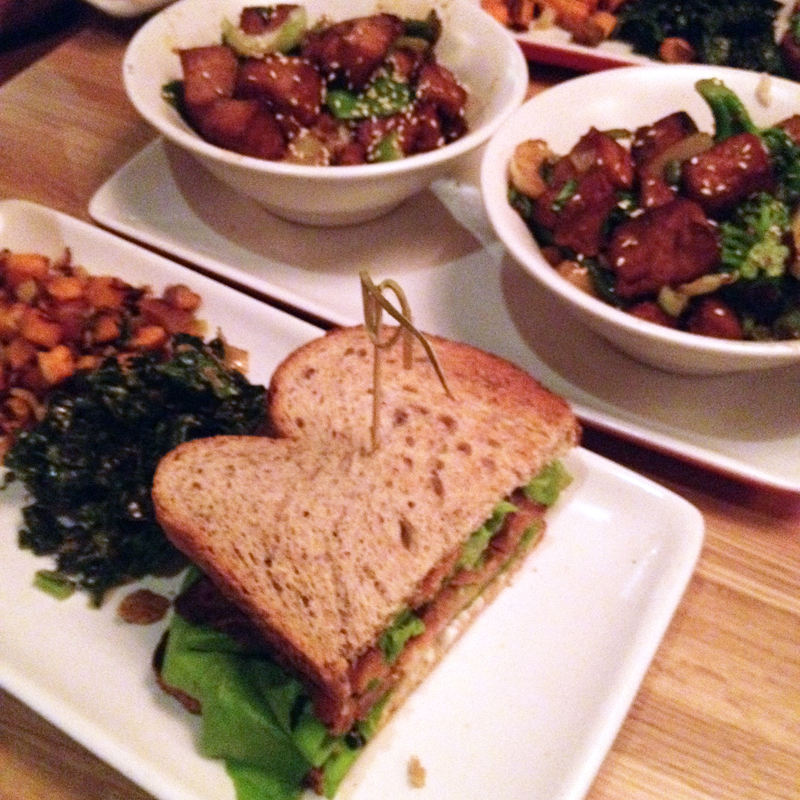 Mr. VE&T decided to order something vegan, so that we could split two things - we shared the Tempeh Lettuce Tomato sandwich (with side of kale salad, and side of sweet potato hash) and some sort of Teriyaki Tofu Bowl. Everything we tried was totally delicious! Can you believe that they even had a vegan dessert!!?? Be still my heart! You KNOW I ordered it! ha ha. 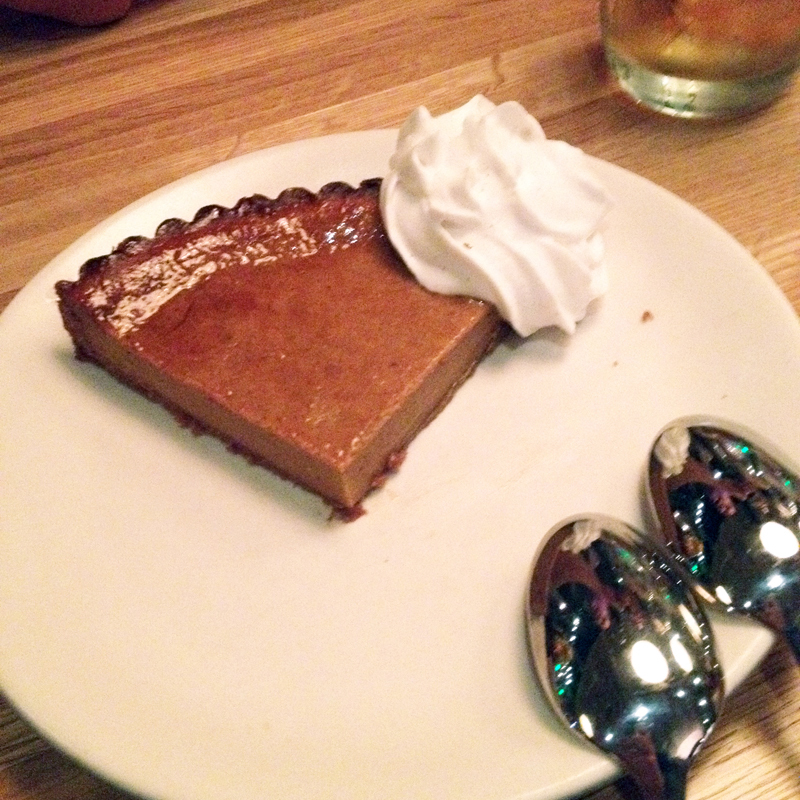 It was a squash pie, like pumpkin pie basically, with totally delicious flavor, a wonderful crust that tasted nutty and graham-crackery, and the absolute best coconut whipped cream I've ever tasted. Soooo good. roasted cauliflower, mulberries, and pomegranate arils. Wowsers! In fact, we liked it so much at True Food that we went back there for our last night. That night, we had Mr. VE&T's friend along with us and he is also a picky eater - in a very different way. He eats a gluten-free, no soy, no corn diet (with a few other restrictions). True Food was perfect because he could order delicious food that suited his needs and so could I! Huzzah! They even had a gluten-free (not vegan) chocolate cake for dessert, so he had that, and I had another piece of squash pie. The food here is all made from scratch, and organic ingredients are used "as much as possible." Even the coffee was fair trade!! That's pretty rad. Apparently it's a chain of some size, with locations in a handful of cities. You're lucky if you live near one, because I thought the food was most excellent! Wow you are so upbeat and positive about not having vegan options! I agree sometimes it can be liberating to be somewhere you can pretty much find only vegetables to eat. Kind of reminds us that we eat to live, not live to eat. Sometimes I get hungry and get in a bad mood about it when I'm out of town with nothing to eat. 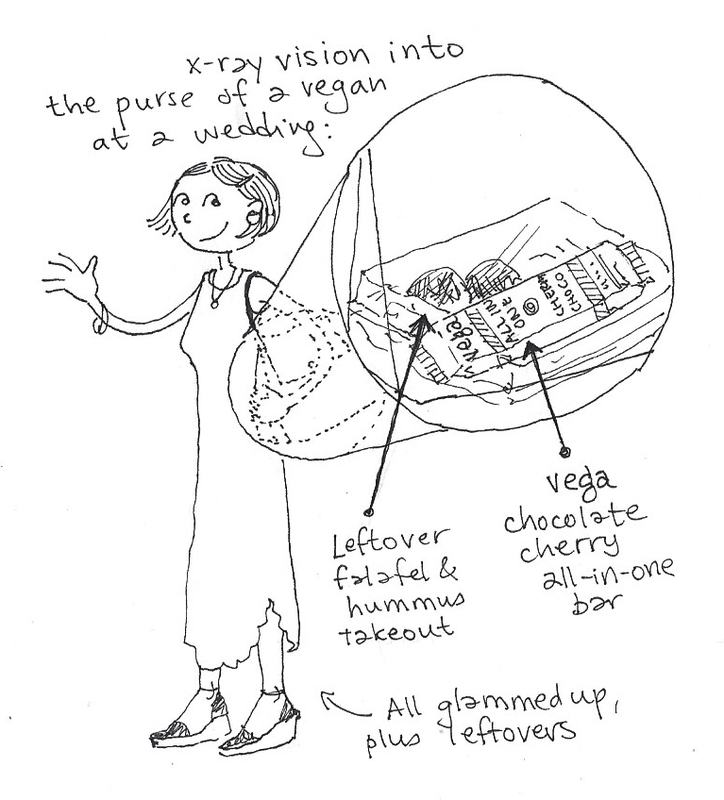 I am wayyy spoiled living in NYC, but have certainly been to my share of weddings with a tote bag full of bars and vegan pb cups! ha ha, well, I'm a pretty upbeat person, but I most definitely have my sad and cranky moments when I can't find something to eat. No doubt about it! I don't usually mind if I've brought along enough food to keep myself happy, but that's rarely the case. One day we went out for breakfast and Mr VE&T had a huge delicious breakfast and I had a meager little bowl of oatmeal. Not my most upbeat hour, for sure! ha ha. Oooh that teriyaki tofu looks so great as does that TLT. 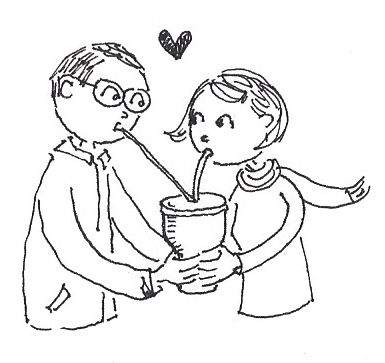 I love your handbag doodle too, mine is always very similar! [ Smiles ] I am for anything vegan. I am guessing that you really had yourself a wonderful time in Atlanta. Last time I went to a wedding I was actually in the wedding party, so I had to pre-make a vegan meal that they could keep in the kitchen and have the waiters 'serve' me, because I was too visible at the main table to get away with Tupperware!